We have been reviewing various emails from different retailers over the past few weeks. We love emails as they are one of the cheapest and most effective tools of retail marketing, as previously mentioned in our first article. Over the last few weeks we have learned the importance of design, targeting and messaging. The focus of this week eCommerce Email Marketing Spotlight is product showcase. 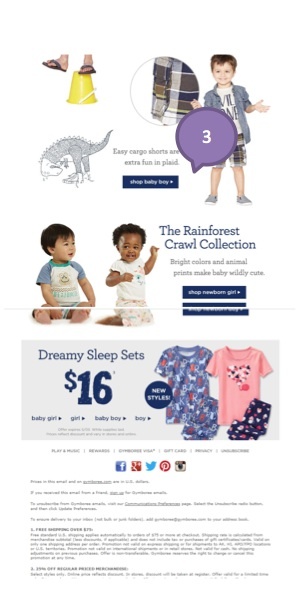 We examine the importance of relevant and clear information about the products featured in the email campaigns from the three retail brands: Gymboree, Home Depot and Yarnspirations. 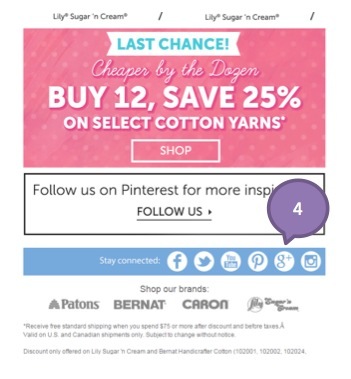 THIS WEEK WE ARE REVIEWING ECOMMERCE EMAILS FROM THE FOLLOWING RETAIL BRANDS: GYMBOREE, HOME DEPOT AND YARNSPIRATIONS. In 1986, the company opened a chain of clothing stores named Gymboree. Gymboree stores offer coordinating children’s clothing. The sizes range from birth to age twelve. Gymboree, in its current incarnation (it has reorganized several times) is incorporated under the Gym-Mark, Inc nameplate. It currently operates 630 Gymboree Retail, 150 Gymboree Outlet, 130 Janie & Jack, and 290 Crazy 8 stores in the United States. Crazy 8 was started in August, 2007. It features lower priced clothing and is Gymboree’s direct competitor for The Children’s Place and Old Navy. 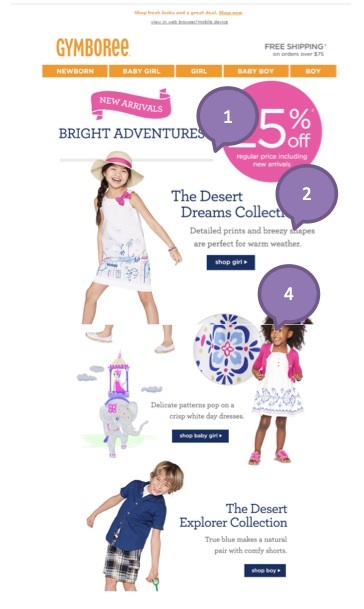 Colors: 5* – the brand color is present but is not overwhelming the entire email theme. The email contains nice spring colors of blue and pink which are relevant to the subject of the email. Fonts: 4* – Easy to read, good choice of colors and size. Very consistent use of caps in the titles. Great contrast of the blue fonts on the white background. Images: 5*– the products showcase is the best that I have seen in the emails to date. It has the collection name, a large image and even a small image of the material. What a great way to engage the reader. Formatting: 4* – clearly defined blocks that display in a logical order, girl, boy and babies. There is a consistent flow to the message. Mobile Optimized: 4*- good color contrast that is easy to read and follow on the phone. The buttons are a bit small for the finger to click but otherwise a great looking mobile email. Clear offer:5* – There is a clear offer and call to action. The offer is appealing to a large audience as it cleverly addresses the needs of parents with all possible options. The urgency to purchase:2* -there is no immediate call to action to make a purchase which is the only thing that is missing from this greatly crafted email. Product highlights:5* – The product collections are clearly labeled, recognizable and link to the right section of the website. This email is one of the best emails I have seen in our reviews. It has all the great characteristics of an effective campaign. It has visual appeal, clear offer, and an amazing product showcase. The only negative is the lack of clear urgency to purchase, but the other factors will definitely drive sales from this spectacular example of a great promotion. By creating enough product offers for the various audience, this email can be sent to the multiple target audience at once. In terms of overall revenue reported to the U.S. Securities and Exchange Commission, the company is the largest home improvement retailer in the United States, ahead of rival Lowe’s. Clear offer:4* – clear and specific offer, appears to a wide audience this time of the year. It is not clear why the other items are shown in the email. They are not related to the main offer. Product highlights:4* – the featured products are clearly identified with full details, price and a link to the product pages. Once again a great showcase of products. However, if the main offer of the email is Behr paint, it should feature more related products in order to allow the shopper to be able to plan their entire purchase required to do painting. The subject line defines the key message of the email and the reader will expect to see more than just 1 paint product based on the subject line. Aligning the subject line with content inside is crucial in order to increase click-through rate. Yarnspirations.com is the invention of Spinrite LP, North America’s largest craft yarn producer. Yarnspirations – established in 1952, Spinrite researches, develops, manufactures, and markets a variety of consumer craft yarn and pattern books for all segments of the market, from classic and cotton basics to novelty and fashion yarns. Encompassing well-known brands Patons, Bernat, Caron, and Lily Sugar ‘n Cream, Yarnspirations.com is a one-stop resource for everything that you need to create knit and crochet projects to suit any mood, budget, or occasion. We provide pattern inspiration, learning resources, a welcoming community, and the ability to shop the broadest product line in the craft yarn industry all in one place. Colors: 4*- nice contrast of different shades of blue, which are the brand colors and in combination with pink and green accents creates an inviting visual appeal. Fonts:3* – the fonts over the main image are hard to read; the background is too busy for readable fonts. The small fonts underneath the secondary images are not easily read as well. Images:3* – the images are not very interesting. The products are not laid out optimally for a proper visual appeal. Formatting:4* – the products are placed in clearly defined areas. The negative aspect is the Pinterest box in the bottom of the page. It does not flow off the overall visual theme of the email. Subject line:2* – no clear motivation to open the email. 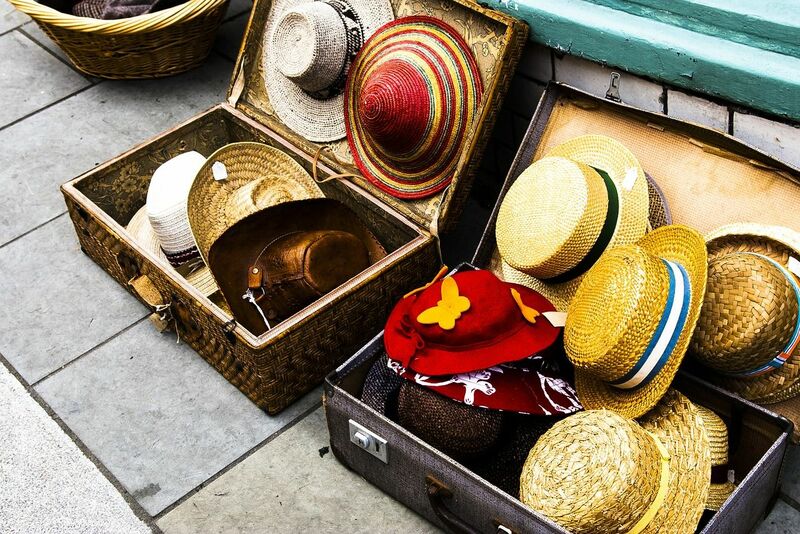 It is more a call to action to visit the retailer’s Pinterest pages. Clear offer:4* – designed to increase purchase of various patterns of dishcloths. The entire email follows the same product theme. This email is from a retailer who is a little bit different, as it sells items to create the final product and not the end product. They have to be more creative about product showcase in order to entice the users to come to their site and make a purchase. Having proper naming, inviting pictures and the clear indication of urgency are a great way to encourage clicks through. The negative is that there are not many people would make their own dishcloths. I know that I would not. Emails that promote this type of product definitely require better targeting. 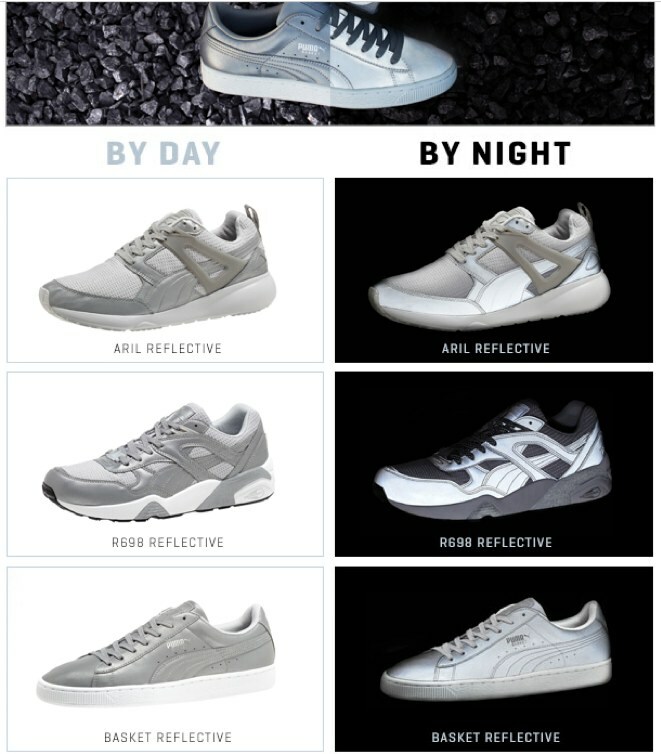 I just received a fun email from Puma that is showing the reflecting elements of their shoes. I am not sure that illumination can be illustrated in a simple email with a black background. The shoes do not even look the same and even have different laces in one of the shots. Nice try nevertheless, at least it was creative! Playful and inviting colors help bring the focus on products and highlight their features. The emails we are receiving are getting higher marks as the weeks go on. We are reviewing more American brands, which are clearly paying more attention to the importance of crafting a perfect email. Canadian retailers, please take a note – an eCommerce email marketing campaign is a very important tool and it will help you sell more if it is done properly.